For coffee lovers, Baratza is a well-recognised name. The Baratza Encore Conical Burr Grinder is the upgraded version of their Maestro machine, which was criticised for not being capable of producing espresso. Described as an entry level machine, it’s priced as more of a midrange. Despite this price tag, it’s a regular appearance on coffee grinder best buy lists. Let’s have a look at why in this Baratza Encore Conical Burr Grinder review. What is good about the Baratza Encore Conical Burr Grinder? For those who love freshly ground coffee, there is plenty to like about the Baratza Encore Conical Burr Grinder. Although classed as an entry level machine, it feels far more midrange, with a high-quality construction. The Baratza Encore Conical Burr Grinder has a generous forty different grind options, which should be enough for all but the most particular coffee drinker. One is the finest grind, and forty the coarsest. The size of grind ranges from just 250 microns to 1200 microns, and it produces a gram of coffee in around a second. This coffee burr grinder produces grinds that are suitable for all methods of brewing, ranging from espresso through to cafetiere and even cold press. Some users state that the finest grind is even suitable for Turkish coffee. The bean hopper is fully removable for emptying and changing the beans or cleaning. It holds just 227g, or 8 ounces, of coffee beans, so needs refilling frequently. It’s transparent, so users can see how many beans are left when grinding. The grind collector isn’t transparent, making it impossible to see how much coffee is in the container. This could be a problem as this machine doesn’t have an automatic grind timer, so the user is unable to see how much coffee they’ve ground. This Baratza burr grinder has just two dials and one button. The dial under the hopper controls the grind. The dial on the side is the on-off switch, that switches between two positions. The button on the front is a pulse button that’s ideal for producing small amounts of coffee, for example, for espresso. 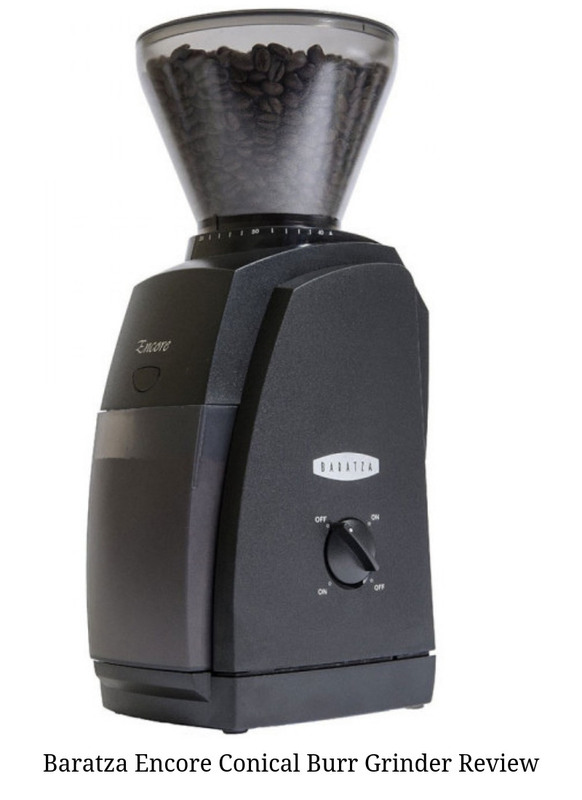 The Baratza Encore Conical Burr Grinder has no automatic grind timer. Instead, it’s down to the user to judge how much coffee they’ve ground. 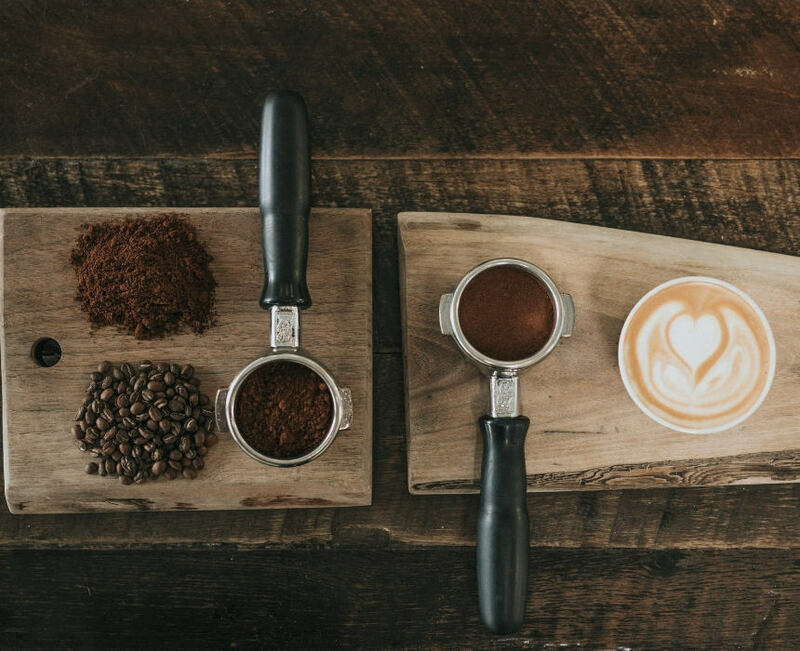 As well as having to manually judge how much coffee you need, it’s complicated by the fact that the grind container isn’t transparent, leaving the user guessing whether they’ve ground the right amount. While this machine can take an espresso portafilter cartridge, this has to be held in place manually and, again, it’s down to the user to judge the right amount. Some users report that the machine needs to ‘bed down’ before it’s capable of producing the very fine grinds, but this could be individual opinion or experience. This machine is simple to clean. 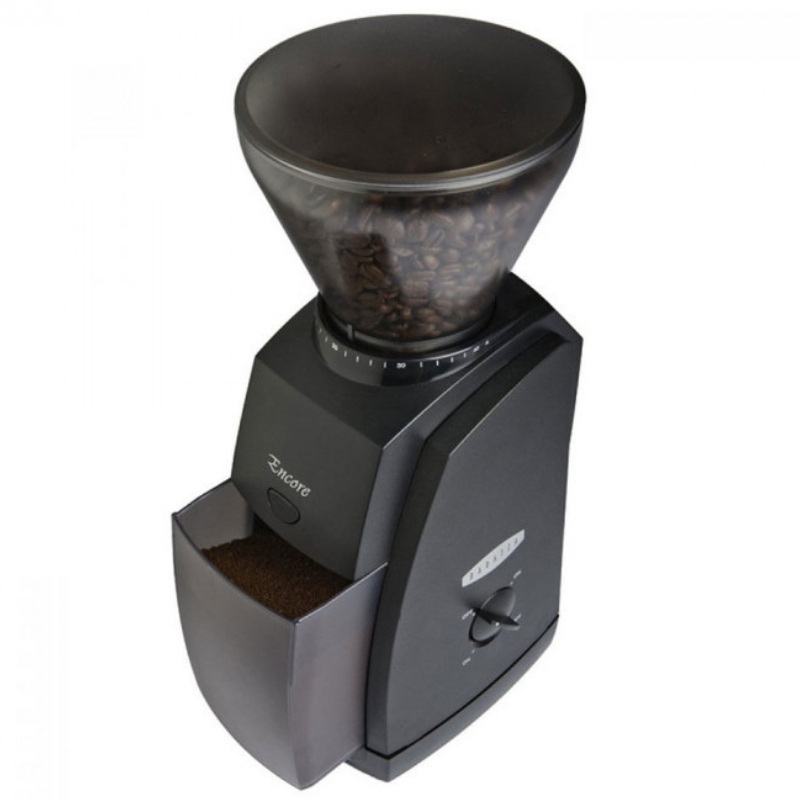 The hopper and grind collector is easy to remove and can be hand washed in soapy water. They must not be put in the dishwasher. The burr grinder is easy to remove, ready to be cleaned with a stiff brush. This machine can be prone to clogging when producing a fine grind, and the dispenser may need to be cleaned. As already mentioned, it offers forty different grind settings, which should be enough for anyone. The pulse function is useful for producing the small amount of coffee needed for an espresso and can be operated one-handed while holding a portafilter cartridge underneath. With limited buttons and dials, there’s nothing complicated about getting this machine up and running. 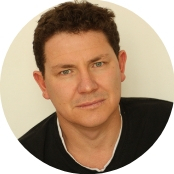 The main limitation is the lack of auto dosing, which can lead to wastage as users guess how much coffee they need. This isn’t helped by the fact that the grind collector isn’t transparent. While portafilter cartridges can be used with this coffee burr grinder, it has to be held manually in place while it’s filled. This machine takes grinding high-quality coffee very seriously. It grinds fairly slowly compared to other machines, at just 450RPM. This prevents the burrs from becoming too hot and protects the oils that produce the delicious aromas. It also features thermoplastic grinding gears that stay cool during grinding, and keep the noise level down. While the burrs have been pre-calibrated by the manufacturer for a great grind, the user can also calibrate them to match their personal grind preferences. This isn’t the most stylish machine. The small bean hopper looks a little like it’s perched on top of the body and looks out of proportion. The body is made of plastic but still feels solid and sturdy. It has a small footprint, measuring just 12cm x 16cm x 35 cm. Despite its small size, it weighs a surprisingly heavy 3.1kg. The Baratza Encore Conical Burr Grinder is classed as an entry level machine but has more of a mid-range price tag. It produces high-quality coffee, with a real attention detail to how it achieves that quality. However, it’s not a touch-and-forget machine. It’s down to the user to figure out how much coffee they need for their preferred brew, which could take time and practice. And while the portafilter function is useful, being able to attach it to the machine would make it easier to use.